Under-employed playwright Norman Harker, fresh on the Hollywood scene, gets involved with a small semi-amateur theatre company, formed and financed by a group of actors to bring themselves to the attention of casting directors. His main interest is the lovely but mysterious ingenue Sarah Plunk, but he also wants to have his play produced under the auspices of managing director Rupert Carruthers and business manager Adam Pennworth. The company is currently working on a strange allegorical play called The Soul Has Two Garments, written and financed by famous and very nearly saintly Arctic explorer (but terrible playwright) Lewis Jordan. The experienced mystery reader’s ears will prick up when we learn that there’s a strange insurance policy in existence that pays $50,000 if one of the principals behind this awful play should die before the production is mounted. Almost immediately, a horribly burned corpse is found backstage, alone in a room locked from the inside, apparently a casualty of an experiment in on-stage pyrotechnics gone wrong; Rupert Carruthers has spent the preceding days quarrelling with his associates and has a long history of gouging and swindling unsuspecting playwrights and actors, and everything points to an impossible murder. The door to the workshop where Carruthers has been working is locked with a very peculiar key; it’s one solid piece, which means to Lieutenant Jackson of Homicide (and amateur actor/detective Fergus O’Breen, part of the company) that no standard jiggery-pokery to hocus the door could have been possible. Besides the company of actors, many of whom have suspicious backgrounds and motivations, the plot is complicated by the involvement of Lieutenant Jackson’s brother Paul, well-known movie star, and his screen partner (and “girlfriend for publicity’s sake”) Rita La Marr, whose sweater seems to contain her principal assets — and Fergus O’Breen’s sister Maureen, publicity agent at Metropolis Pictures, home of the Jackson/La Marr pairing. Is this well-known romance finally over — and why? And since everyone wants to be noticed by Metropolis, has someone hired well-known “ribber” Vernon Crews to impersonate an important person and get some publicity? Finally Lieutenant Jackson, assisted by Fergus and Norman, works out what must have happened and brings the criminal to justice. In the process, a romantic pairing reaches a satisfying conclusion and many mysteries, large and small, are solved. 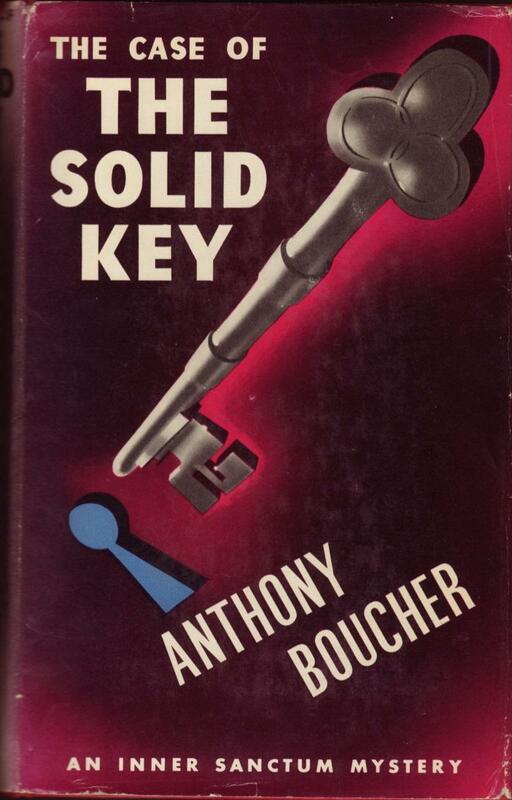 As I’ve noted elsewhere, anything by Anthony Boucher is worth reading. They named the world’s largest mystery convention after him — what else do you need to know? His specialty was locked room mysteries and/or impossible crimes. This is the third of four Fergus O’Breen mysteries written between 1939 and 1942, and taken as a whole, they are great work by this great mystery aficionado, prominent critic, and all-around polymath. Fergus O’Breen is brash and charming and devil-may-care; some of the characters are unusual and interesting; and the crime at the centre of the novel has a number of satisfyingly twisty interpretations before the detectives reach the correct conclusion. 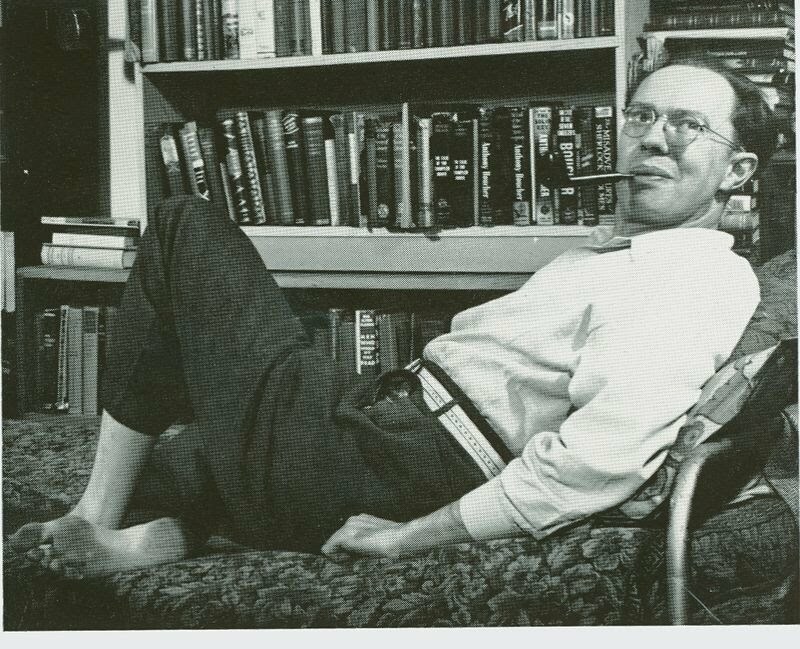 In fact, as you can easily tell, I’m a big Boucher fan, whether he’s writing mysteries or science fiction or fantasy or radio scripts or criticism, at all of which he excelled. That being said — this is not his best work. But let me add, Boucher’s second-rate work is better than a LOT of other writers’ first-rate work. I’m not saying this is a bad book, merely that it isn’t as superb as most of his others. There are a number of things wrong with the plot, most of which I can’t go into in depth because I will spoil your enjoyment. I’ll merely say that a handful of the characters are not easily distinguished one from the other because they’re rather bland; the central premise of the locked room isn’t all that gripping or indeed necessary to the plot; and if there is anyone who doesn’t figure out the “surprise” behind the Jackson/La Marr subplot before the book is half over, well, they should go back to Young Adult reading. A couple of the characters are petty squabblers, and it doesn’t seem that there is any reason for them to be so except that the book needs a little tension. And the character of Vernon Crews, perhaps the most interesting idea in this and other Boucher novels, is offstage, to the detriment of the plot. Crews is based on someone who actually existed in Hollywood at about this time; Vince Barnett was a bit-part actor who made more of a living from acting by being hired in real life to impersonate people or play preposterous characters so that wealthy Hollywood people could play elaborate practical jokes on each other. Now, THERE is the basis for a mystery I’d like to read some day. There are a couple of other minor issues that niggled at me as I refreshed my memory of this book; I like the character of Fergus O’Breen, but he’s not much on view here because the viewpoint character is most often the bland playwright. And Boucher is well known for adding little snippets of side information that cast an oblique light on the plot; here, the excursions into other areas (such as the visit to an all-girl rooming house near the end of the book, or an amusement park) seem a little forced and artificially vivacious. The romantic sub-plot between the playwright and the ingenue is … sticky sweet and a little unpleasant, especially when you contrast Sarah Plunk with a sad alcoholic actress with whom she chums around. There’s also a character in the book who is what we would call today gay and, as I remarked in my last piece on a Boucher book, this is unusual for the time and place. I can’t say exactly why I have a problem with this character for fear of spoiling your pleasure, but you’ll know by the end of the book what my issue is — I just cannot accept that he does what he does for the reasons that he gives. It’s an interesting take, but it doesn’t come together, to the detriment of the book. Similarly, Lewis Jordan is probably based on someone in real life, but he doesn’t ever actually come to life; he’s simply cardboard, which is a shame. I wish Boucher would have taken a little bit longer with this book, or perhaps run it through one more draft before publication; the elements are here to produce a tremendous mystery but it doesn’t actually quite come together with the satisfying “click” that marks his best work. Nevertheless — a second-rate novel by Boucher is still a damn good mystery, and there’s an opportunity here to see a certain element of 1940s Hollywood society depicted by a brilliant writer who actually knew people like this. All four Fergus O’Breen novels are worth your time, even if this one should be fourth on the list. To the left is Popular Library #59 from 1945, a delightfully lurid cover of an early number from this ground-breaking publisher before they moved to their equally delightful “breasts and guns” themes in cover art exemplified by the great Rudolph Belarski (check out this cover). 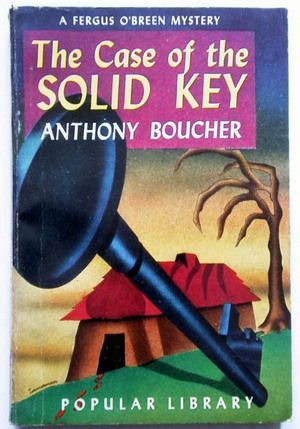 Other than the fact that there’s a key, I can’t figure out what the cover is intended to depict; it doesn’t appear to relate to the book at all, and I don’t really care. Look at those colours! A Near Fine copy of this early paperback will set you back $40 as of the date of this writing and I think I’d rather own this edition than the Simon & Shuster Inner Sanctum first, shown above (and today’s price for a Near Fine one of those is $400). Also noteworthy — perhaps for different reasons — is the edition shown at the head of this review, Pyramid X-1733 from 1968, possibly the paper edition most commonly available. This is an entry in their “Green Door” series that could have used the linking device of the green door to great effect, except they’d apparently moved on by that point. So the front cover is merely ordinary. And I have to say, the back cover material intended to give you a taste of the book’s contents is simply and egregiously wrong, almost to the point of giving away the answer to the book. Although there are collectors of the Green Door series, and I’m one of them, if you don’t have a particular interest in this edition you should avoid it. 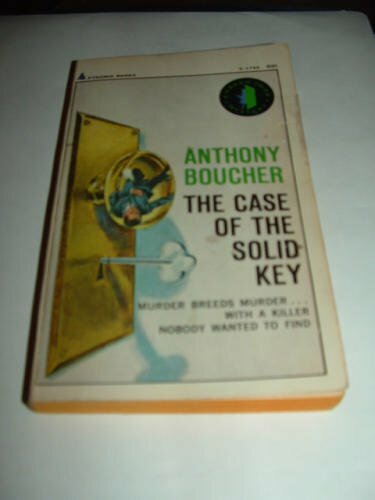 This entry was posted in Brand, Detective fiction, Golden Age of Detective Fiction, Locked-room mystery, Mystery, Mystery writers, Novel and tagged Anthony Boucher, Fergus O'Breen. The Pyramid edition shown at the top, from the 60s, is usually affordable. All his books are worth owning, I think.